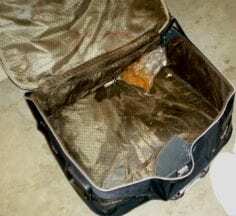 The BC SPCA has intensified its search for information on a female, chocolate-coloured pit bull who was found stuffed into a suitcase in a lane behind the 200-block of East 12th Avenue (between Main and Sophia) after learning how the animal died. The deceased dog was found by passersby in a black Kika brand suitcase near a dumpster on Nov. 29. Raw, bloody marks around her muzzle suggested to investigators that her mouth had been wound tightly with a restraint – likely nylon or wire. The chocolate-coloured pit bull was about four years or older, with cropped ears. She has white paws with brown spots and looks as if she’s had puppies in the past. Anyone with information on this case is asked to please call the BC SPCA’s Cruelty Investigations Department at 604-709-4670. The BC SPCA conducts nearly 6,000 cruelty investigations a year and is reliant on donations from the public to continue its work. Your gift can help rescue and protect innocent animals, and bring their abusers to justice. Please donate today. Photo caption: A deceased female dog was stuffed in a suitcase and left beside a dumpster in Vancouver. Reports reveal the dog died of blunt force trauma. BC SPCA officers are asking anyone with information to call 604-709-4670.